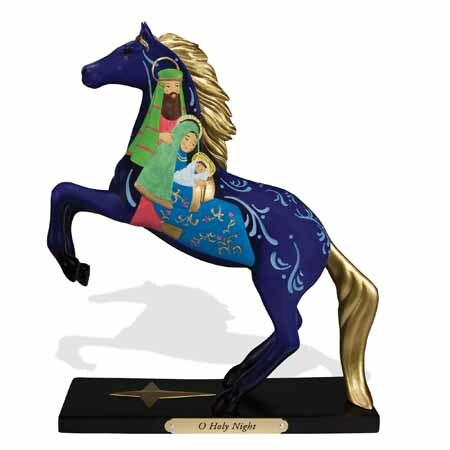 O Holy Night | Holiday Ponies Figurines | One Price Low Flat Shipping! From the Trail of Painted Ponies Holiday 2016 Collection, O Holy Night. Made of stone resin. Measures 8.3" tall. Designed by acclaimed equine artist, Laura Cook. Against a rich blue background in stylized fashion, this pony figurine captures a moment of quiet intimacy shared by Joseph, Mary and the baby Jesus, who are surrounded by swirling patterns that symbolize the wondrous events that are about to happen.